Taps are running dry and doors are closing at neighborhood bars across the country. That has left the remaining ones to try to find ways to stay afloat. NEW YORK (AP) — Taps are running dry and doors are closing at neighborhood bars across the country. That has left the remaining ones to try to find ways to stay afloat. One in six bars closed between 2004 and 2014, according to market research firm Nielsen. More than 600 close each month, with just 334 opening. The neighborhood bar closures are happening as more people are getting their alcoholic drinks from restaurants, cavernous sports bars with scores of TV screens, brewpubs and at home. Besides the increasing competition, neighborhood bars also are contending with other challenges, including rising costs for expenses such as rent. For instance, when the rent doubled seven years ago at Mumbles in New York City, running a neighborhood bar became more difficult for owner David Feldman. Online reservation and order-taking services took more bites out of his profits. At the end of January, after 22 years, Mumbles closed. "It's getting harder and harder. The bigger corporate restaurants have tons of money, that seems to be the way things are going," says Feldman, who still has two restaurants in Manhattan, one of which will now employ one of Mumbles' bartenders. The number of neighborhood bars has declined as drinking habits have changed, says Lester Jones, chief economist with the National Beer Wholesalers Association, a trade group. Tougher laws on underage drinking and drunk driving have cut into consumption. The growth of in-home pay TV services has also had an impact; when relatively few homes had cable in the early 1970s, sports fans went to bars to see games that weren't on broadcast TV. There were nearly 10 million cable subscribers in 1975 and close to 100 million pay TV subscribers last year, including cable, satellite and telephone company-delivered services, according to research firm SNL Kagan. People don't need the corner bar. When consumers do go out, they have a rapidly growing number of choices. Restaurants including national chains have bars and advertise their beverages as much as their food. They're also the kind of place where parents can take their kids and have a beer with their meals. And the chains are growing; the number of Buffalo Wild Wings locations has tripled from 370 in 2005 to 1,136 by the end of 2015. 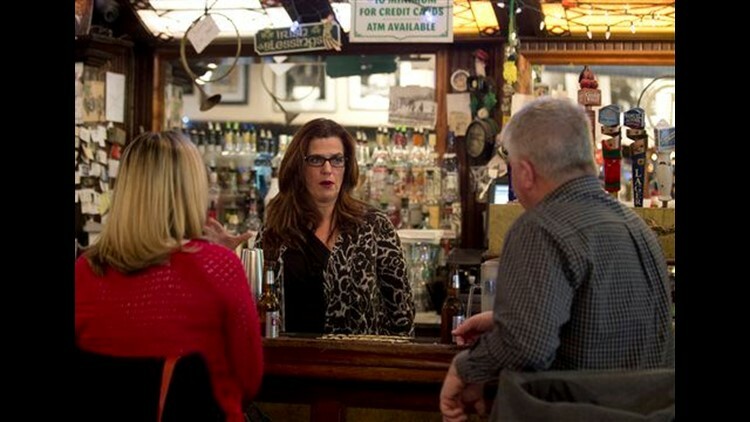 Rising costs also have hurt neighborhood bars. Rent increases, in particular, are typical of areas that are trendy or have high real estate taxes. Urban areas where residents have big incomes have seen the largest increases in rents for retail space, which includes bars, says Ryan McCullough, a senior economist with CoStar Group, a real estate information provider. Rents in those areas nationwide are up an average 9.4 percent since the high they reached before the recession. But in areas where demand for real estate is particularly high, rent increases can be substantially higher. Rents on a trendy stretch of Broadway in Manhattan not far from Mumbles soared 42 percent between the fall of 2014 and this past fall, according to the Real Estate Board of New York, a trade group. Other cities see similar increases: In Miami, retail rents rose an average of nearly 33 percent from 2011 to last year, with rates in the hottest areas climbing at a higher pace, according to Cushman & Wakefield, a real estate services company. In addition to higher rent, neighborhood bars have to contend with other rising costs. Larger companies with multiple locations can buy beer, liquor and food at lower prices because they get bigger discounts — the New York State Liquor Authority mandates a 40 percent discount on purchases of 50 cases, compared to 20 percent on five cases. A higher minimum wage and rising insurance costs also sap profits, says Tess Collins, who runs McGeary's in downtown Albany, New York. But Collins brightens as she talks about McGeary's customers. The bar draws a regular after-work crowd and people visiting the state capital on business. Families show up on weekends. There are seven TVs in the main bar and two in a back room, but Collins finds her customers are more interested in talking to each other than watching a game. "I have an awesome community here," says Collins, whose bar is nearby Recovery Sports Grill, a sports bar and restaurant that has 35 screens and is part of an 11-location chain. "Everybody knows each other." Many owners have to pass on their higher costs to their customers, or look for lower-priced food options for their menus. When his landlord raises the rent, bar owner Scott Drake has to pass along the costs to his customers. Drake, who co-owns Moe's & Joe's, a nearly 70-year-old Atlanta bar, sees higher rents as a neighborhood bar's biggest threat. But he says smaller bars offer something more intimate than the bigger guys can serve — what he calls a neighborhood feel. For that reason, Drake is less concerned about the competition, which includes a nearby Yard House, part of a 64-location chain and that has 130 taps and 20 TVs, compared with his bar's 18 taps and seven TVs. "On any day, you can come in here, and there are tables with construction workers, maybe two prominent judges and a couple of people from the banking industry, all walks of life," Drake says. "I want to have a conversation in a bar and talk with people and I think a lot of people (at the big establishments) are missing out on that." One of the regulars at Moe's & Joe's, John Webster, has been going to the bar for decades. "It's like an old pair of jeans, very comfortable. You know what you're going to get," he says. "You know the people, you know the staff, the bartenders." Jim Wiste, who owns Campus Lounge in Denver, agrees. The relationship between Wiste, a former pro hockey player, and his customers is a big part of the appeal. He'll help them get tickets for a big game and make the bar available for people who want to hold a memorial for a friend or relative. But Wiste has added more TV screens to compete with bigger chains. The bar now has 15 screens, but it still is a place where regulars hang out and families stop by for a weekend lunch, owner Jim Wiste says. "I think there's something to the old standard place that's on the corner, a local place that feels a little more comfortable," he says.